Patra's Other Place: Native wildlife experiences. Australians who live in the suburbs of capital cities are generally delighted by close encounters with our native animals and birds, whereas the folk in rural Australia probably take it for granted, and even see some animals and birds as pests, because they eat the crops. I live on the fringe of suburbia, and we get many native birds in our yard, an occasional koala in the trees, and now and then a few roos from the vacant bush blocks at the top of our street. Ken and I love all these, and we encourage the birds and possums by leaving fruit and seed out for them most days (although this is frowned on by Those Who Think They Know Better, but we're of the opinion that the animals and birds are not depending on our little treats for survival - they'll survive when we're gone!). Some creatures don't fancy seeds and fruit though, so they are harder to please if you want them in your garden. Kookaburras for example are carnivorous, and their diet includes mice, rats, small snakes and birds. We have an ongoing mice problem in the aviaries - like anyone who keeps birds of any sort in a large enclosure - and Ken has tried several means of keeping them under control. He used rat poison for a while, but realised that it doesn't kill the rodents immediately, and they could get eaten by cats or birds, which would then get sick and die, so he stopped using poisons. Now he just sets traps with a bit of cheese or peanut butter, and when we find the mice in there, he "disposes" of them (I'm not going into the details). Lately though, I've been doing something else. I take the trap out of the aviary and let the mouse loose - with Tiger watching closely. He has had hours of fun racing around the yard after mice, and a nice little hot meal to finish off. Ken thinks this is cruel, but I argue that if the mice were out in the yard the end result would be the same. However, last week things took on a new twist. I brought a trap out of the aviary and set it on the table to look at the little mouse. The young ones really are cute, no matter what you think of mice, and Ken and I were reluctant to leave it to be tormented by Tiger. I remarked that it was a pity there were no kookaburras around, and right on cue, there was a cackle overhead, and we looked up to see a kookaburra in one of the trees, with his head on one side looking at the mouse trap! It was such a surprise! I grabbed Tiger and locked him indoors, put the mouse trap in the middle of the lawn and set the mouse free. 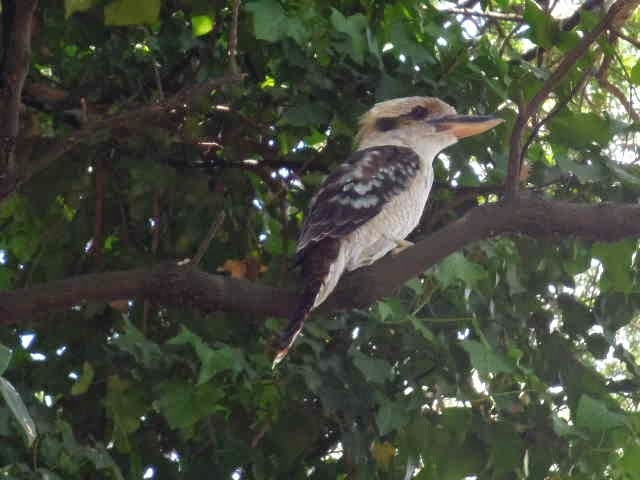 It stood there for a few seconds sniffing the air but before it could make a move, the kookaburra flew down in a blur of wings, snapped it up and landed on the branch of a tree, cackling happily. We felt as if we had just been watching a wildlife documentary on t.v. - you just don't expect to see these things in your own back yard! From now on, we are letting any mice stay in the traps until the kookaburras are around, and they are in the area most days. They do have incredible eyesight, and I reckon they know there are mice around here. There was a dead mouse in the trap today, and a kookaburra was up on his branch watching, so I threw the mouse on to the lawn and as quick as a flash, it was taken.